A couple of months ago, V and I were invited to an advanced screening of Oogieloves in the BIG Balloon Adventure. Armed with creative thinking, teamwork, and enthusiasm, the Oogieloves set out on a quest to find magical golden balloons in time for their friend's surprise birthday party. It stars Jaime Pressly, Cloris Leachman, Chazz Palminteri, Toni Braxton, and Cary Elwes. The roles they play are hilarious and will appeal to the over 7 crowd while keeping it G rated, of course. The Oogieloves are super adorable and will keep everyone singing and moving to catchy little songs. It's an interactive film so the little ones (or the entire family) can move around and be as loud as they want to! It really is a movie the family can enjoy. There's no scary parts, no one dies, and there's no bad guy. It's quite engaging for toddlers. Just look at Violet's face? She danced a little bit too! She was probably watching the scene below given her passion for bubbles! For theater listings and showtimes, visit Fandango or Movietickets.com. ....and now for a GIVEAWAY!!! 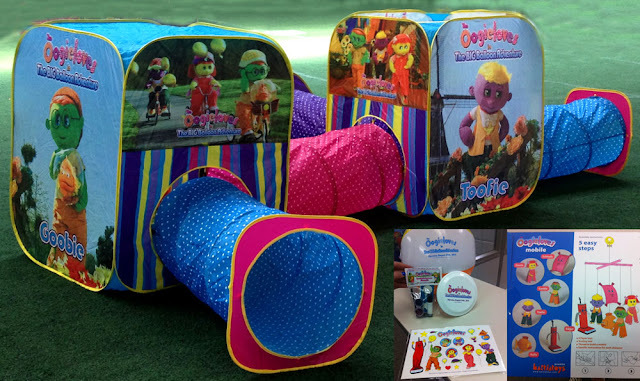 To celebrate today's premiere, I was given an Oogieloves Kids Prize Pack to gift to a reader. a tent, a mobile, 2 sets of glitter tattoos, 2 sets of stickers, and 2 beach balls. To enter, complete one of the activities in the rafflecopter form. I have heard a lot of great things about this movie.Would love to take the pee wee's to see it. My fav character is Goobie. Oh how I remember and miss these days....fun fun fun!!!! I passed a convention of some sort in Manhattan on Monday. I had no clue what this was. I guess I still have about a year before my boy can enjoy. OMG - she's so cute! Oh we love Toofie! Have not seen it yet, but cannot wait! I love that its so silly, and they sing and dance! I know we are going to love it! Moo is dying to see this movie. Might have to take her to see it now that we're back home.